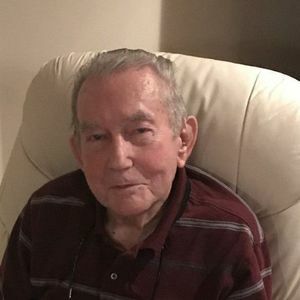 Aubrey Earl Jones, 92, went to be with the Lord on the 17th day of March, 2019, in Lebanon, Ohio. A Memorial Service will be held at First Baptist Church of South Lebanon, 505 Mason Rd., South Lebanon, OH 45065, on Weds., March 20th , 2019, at 10:00 A.M. Rev. David Frasure Officiating. Funeral services will be held at the Tucker Funeral Home in Central City, Ky. Viewing will be from 10:00 A,M. to 12:00 P.M. on Thurs., March 21st, 2019; funeral at 12:00 P.M. Rev. Earl McGuffey Officiating. Interment will be held at Shavers Chapel Methodist Church cemetery in Bremen, Ky. where he will be buried in his family plot. Born May 20, 1926, near Greenville, Ky., to Oscar and Leona Jones. He is preceded in death by both parents, three brothers, Ervie, Otis and J.C. Jones, and his third wife, Mima (Drake-Fleming) Jones. He retired from GM after 32 yrs. He was a former member of Forest Grove Baptist Church, Cedar Grove Baptist Church, and joining First Baptist Church of South Lebanon, Ohio, in 2017. He is survived by three daughters, Linda Jones McGuffey (Mark), Barbara Ann Norman (Tony), Mary Davidson (John); three stepdaughters, Sharon Davis, Diana Gallagher and Doris Hutt, numerous grandchildren and step grandchildren, nephews, nieces and cousins. In lieu of flowers tax deductible donations accepted to First Baptist Church of South Lebanon, 505 Mason Road, Lebanon, Ohio, building fund. Online condolences may be made at www.tuckerfuneralhomes.com. The beautiful and interactive Eternal Tribute tells Aubrey's life story the way it deserves to be told in words, pictures and video. May the "peace of God" be with your family in this time of deep sorrow.